Innovation is a concept that is often tossed around a little too freely without much definition of what it really means, or even how to achieve it. 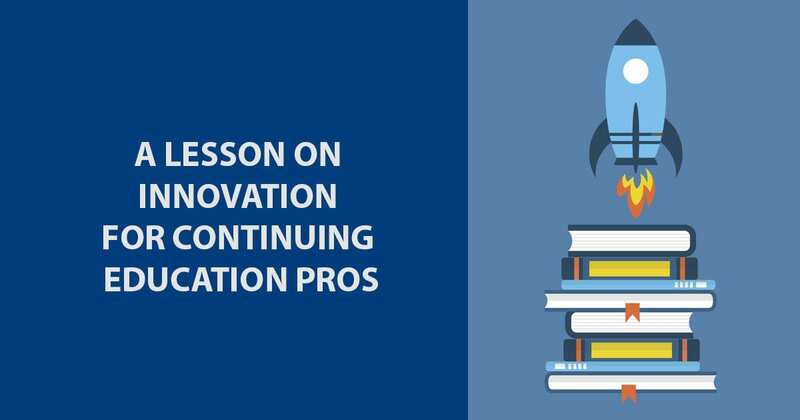 In almost every industry, organizations are tasked with finding ways to continually innovate and transform—in the continuing education and training industry, this means continuing to produce innovative educational programming. Without a clear understanding of how to apply such an abstract concept, however, most of us tend to default to focusing improvements on the very concrete, daily tasks in front of us. The opening keynote session at this year’s ICE (Institute for Credentialing Excellence) Exchange Conference led by Dr. Megan Alrutz, encouraged attendees to experiment with the notion of innovation, even if it meant going beyond our comfort zone. Can you have safety with innovation? Think about a time in your life when you stepped into the unknown. She encouraged us to “play in the space that is uncomfortable” and challenge ourselves to grow during these discussions. She compared this “uncomfortable space” or “threshold” to that where the ocean meets the cliffs. This space is not the calm found in the middle of the ocean, nor the solid foundation of cliff formations. The threshold is the place where the energy of the waves challenges the sturdy and majestic cliffside. This is where innovation happens. As the groups engaged in lively discussion, a very distinguishable buzz and energy permeated the room. This energy continued as everyone came back together for the full-group discussions. As the conversation started to dissipate, a sense of calm washed over the room. It was at this moment that Dr. Alrutz would throw out another question for group discussion, bringing with it the same buzz, followed by calm; buzz, then calm, again and again. The room became a tangible illustration of the very threshold where the ocean meets the cliffs that Dr. Alrutz described earlier. I believe this was her way of demonstrating how innovation is supposed to feel: moments of buzz and chaos, followed by brief moments of calm. If you can find small moments throughout your day to incorporate these two commitments, even while tackling your daily to-do list, you’ll be on a path to innovation without even realizing it.